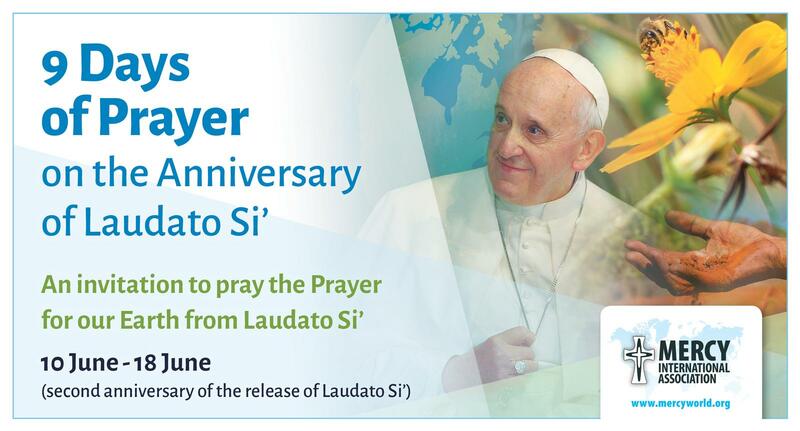 Editor: 18 June marks the second anniversary of the release of Laudato Si'. To maintain the momentum begun by the Mercy International Reflection Process, in 2017 the dates of April 22 and 23 (Mercy to Earth), 12-16 May (meeting of MIA Members and Board), 18 June (second anniversary of Laudato Si’), and 24 September (Mercy Day) were determined in the MIRP Review as 'pivotal moments for global communication and reflection'. Commencing on Saturday, 10 June and concluding on Sunday, 18 June, we will be invited to reflect on a verse from Laudato Si' with a short video in the form of a reflection, song or story included in the reflection page for each day on our Mercyworld.org website. The reflection pages are available here and will be launched in MercyeNews on 7 June (Issue #724). To assist individuals, communities and groups in preparing for the 9 Days of Prayer, a prayer sheet and poster in English and Spanish have been produced. We invite you to display these and to share these widely. The Mercy to Earth posters and 8th Work of Mercy poster are also valuable resources for the anniversary.